This is a sponsored post. I received a fantastic box of art supplies from the new Martha Stewart Jewelry line. The tutorial is my own. To read my full disclosure policy, please click here. 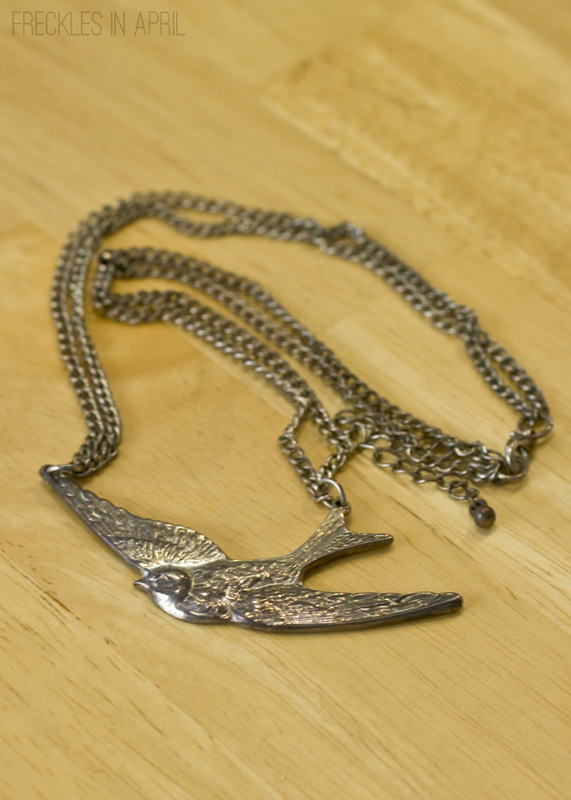 I've had this bird necklace for a very very long time. We are probably closing in on 11 years of togetherness here. I stopped wearing it several years ago because it started to look tarnished and yucky. It used to be bright silver but now is almost black in some places. It was a cheap necklace to begin with and definitely not meant to be the kind of piece you hold on to for a decade. I couldn't bring myself to toss it though. I've had this necklace longer than I've had my husband. There's an emotional tie there. 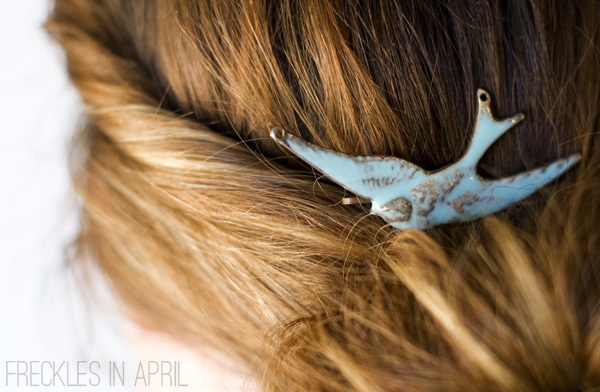 Rather than letting it continue to hang loved but unworn on my jewelry tree, I decided to upcycle it into an enamel hair clip. I have plenty of necklaces but zero hair accessories. I wear my hair up a LOT in the summer and I've been wanting something pretty that I could easily pin in to make my chlorinated updos look a little fancier. Everything I used is from the Martha Stewart Jewelry line. SO many fantastic tools, jewels, etc. 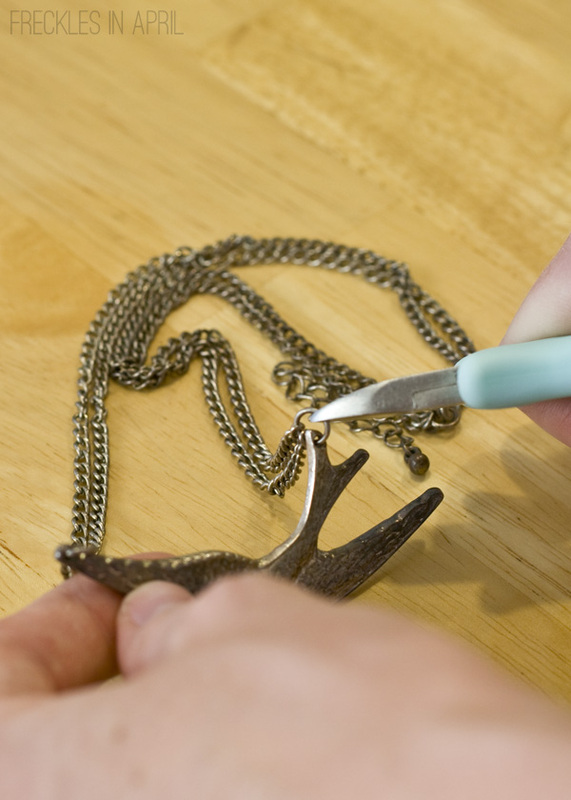 If you're even remotely interesting in creating or upcycling jewelry, you have to check it out. I started by using the small flush cutter to snip off the old jump rings. Then I tossed the chain. There was no salvaging that sucker. 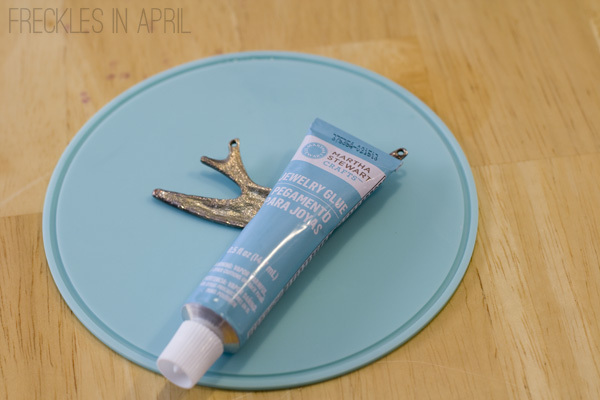 Here's my enamel! 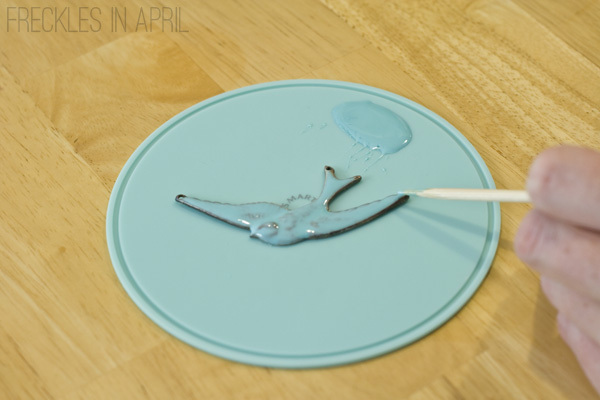 A little tip: shake or knead the enamel colors thoroughly before using. I did a half-hearted job the first time and ended up having to do it again because it wasn't mixed enough. Also, the enamel is quite watery so be careful when squeezing! Use 1 part enamel to 2 parts activator. I used a few drops of blue and a hint of yellow. Also, I got WAY too much. A little bit goes a really long way! 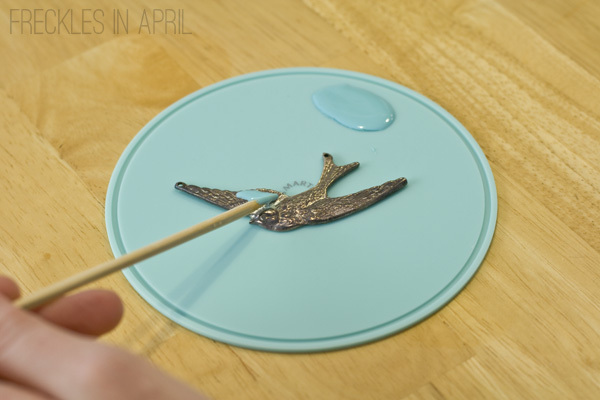 Adjust colors as needed then you're ready to start enameling! If you use the enamel right away it will be thinner. If you let it sit for a bit, it will thicken and give you more coverage. I wanted a thinner coat so I got cracking immediately after mixing. 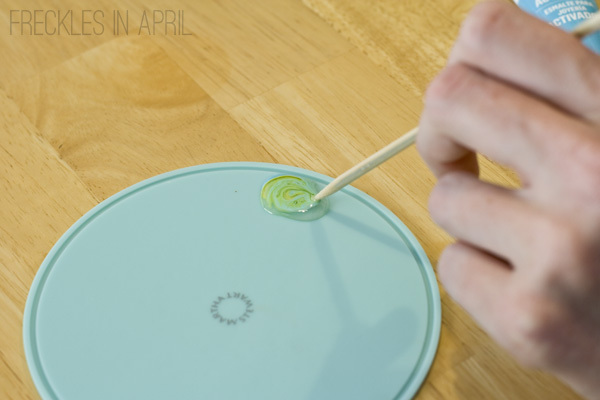 Use a toothpick/skewer to pull the enamel around the surface of your piece. I debated about adding another color but decided against it for this project. 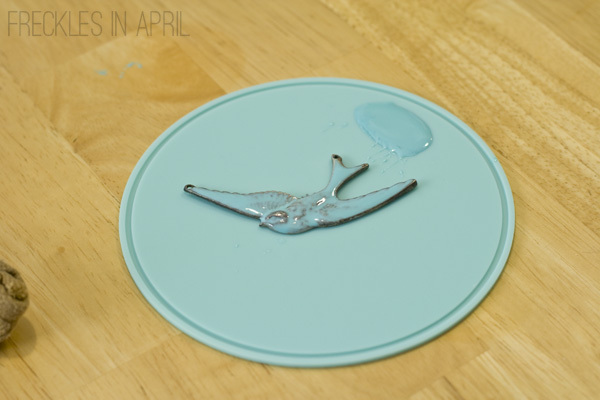 But check out the examples on the website for how you can do different colors. I am so inspired by that scalloped ombre locket! I wanted the metal to show through a bit more so I used a rag to dab the enamel off some of the areas with more detail, such as around the head. Here's the awesome part about this enamel- it air dries. We're starting to see 100+ temperatures and I reeeeally don't like turning on my oven right now. Just let the enamel sit for 24-72 hours to dry and you're golden! 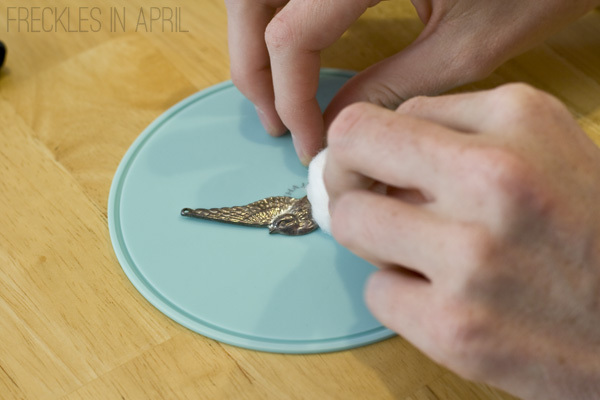 The next day I used jewelry glue to cement the bird to an extra large bobby pin. 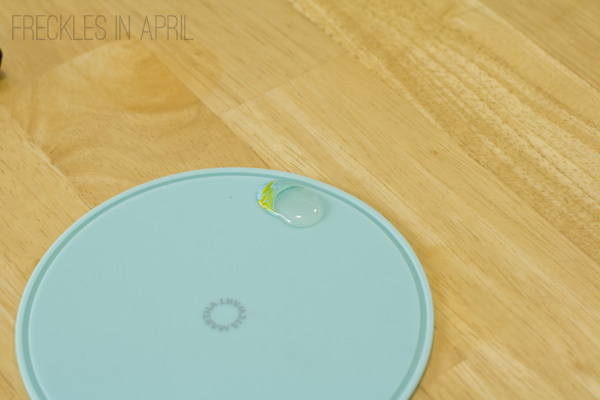 Again, use rubbing alcohol to clean your surface. 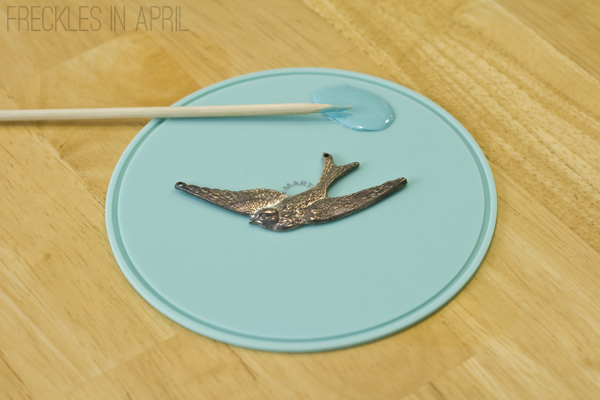 Rough it up a bit with sandpaper then swipe it again before dabbing on your glue. Let sit for 24-72 hours and ta-da! This project had quite a bit of drying time but the hands-on time was about 7 minutes. That is my kind of DIY project! 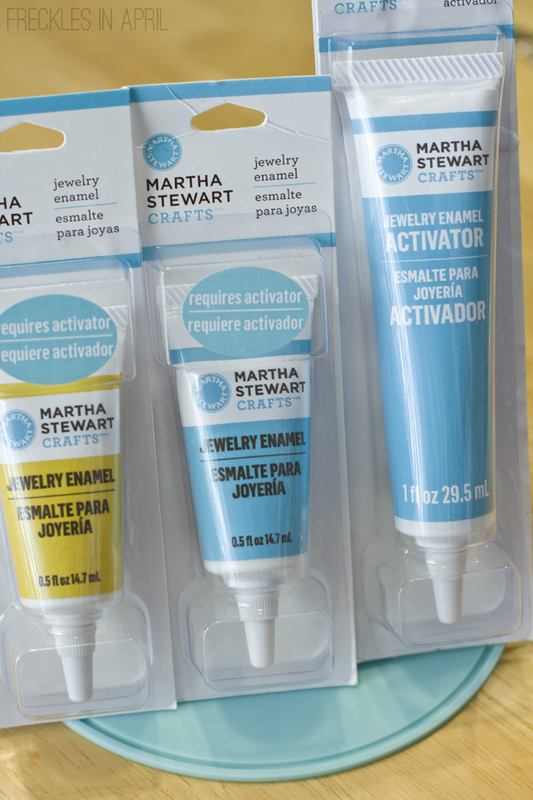 Check out the Martha Stewart Jewelry line for enamel, tools, and about a million other fun things! Disclosure: Materials were provided to me by Blueprint Social. Opinions and tutorial are my own. Love this! And love the new blog facelift too. That is so pretty! I love the way the enamels look on it! Very nice. And easy to understand the process. This is so pretty! 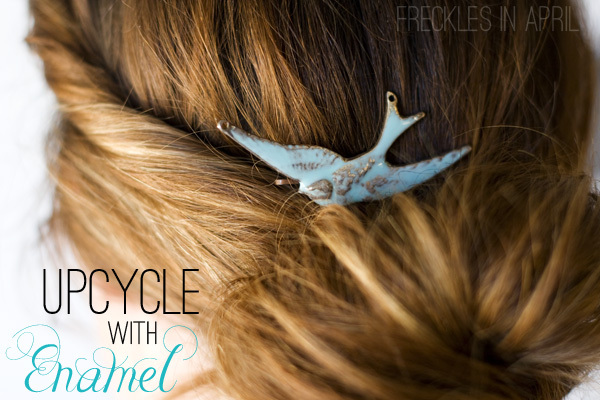 What a neat way to repurpose an old piece of jewelry. I love this tutorial, and I love your new blog look! It's so fresh and fun! This is awesome - it looks great! This idea is genius, and I can see why you were hesitant to give up your birdie. Yay for giving it new life! What a pretty update... I love the shade of blue you used!